– The overall height has been changed to the approx. maximum height including considerable tolerances since Jan. 2014. 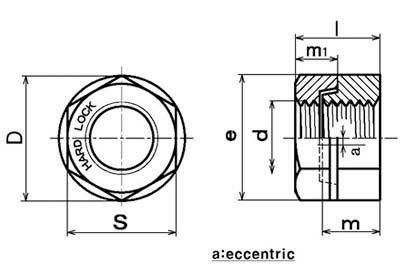 – S45C is used in the concave nut with rim of Class10. – Class4 with HDZ35, Class8, Class10 are available in over M8. – Fine threads are available in Basic type. – M20 – M30 in A2(SUS304 equiv.) are avaialble in Basic type because their rim types are currently under development . – Please be advised that the dimentions or specifications may be subject to change without notice.